Carrying out mitigation measures to make road SR 83 “Marsicana” safe for bears between the villages of Gioia dei Marsi and Gioia Vecchio. Vehicular traffic on the roads that cross the habitat of the Marsican brown bear (Ursus arctos marsicanus) represents a continuous danger to this species and it was a cause of death of several bears, including a very precious female hit near Pescasseroli in May 2011. Salviamo l’orso is surveying the road network in some sensible areas either inside Abruzzo NP or out of its borders. We need to detect the most critical segments that can be equipped with visual deterrents for wildlife. Actually, these are special studs that signal the passing by of cars and vehicles by reflecting their lights towards the roadsides and the forests, in order to prevent wildlife from crossing the road. These tools, together with other devices (such as wildlife bridges and underpasses) have proved to be effective in reducing wildlife mortality across several areas in northern Europe, Canada and the USA at the same time increasing the safety of drivers on the roads. This present work mostly referst to Ciabò S., Fabrizio M., 2012. Reducing the cases of death of the Marsican brown bear due to anthropic causes. Reducing wildlife-vehicle collisions regarding the Marsican brown bear in particular in its core area through mitigation measures of the risk of wildlife-vehicle collision. Priority area: Road SR 83 “Marsicana” (ex SS 83) in the stretch between Gioia dei Marsi – Gioia Vecchio (from km 22 to km 30), in the municipal territory of Gioia dei Marsi (AQ). According to some assessments, road accidents involving wildlife are about 2% of the total amount of road accidents, in 2-5% of these cases, injured people are reported, in 0,03-0,05% it occurs the death of one of the passengers at least (Dumant et al., 2000). The volume of vehicular traffic and the speed of the vehicles influence wildlife movements across the roads. Regarding the speed, many studies have shown that the number of accidents on the road stretches with vehicles moving at a speed lower than 70 km/h and the same volume of traffic, is much reduced compared to roads where the average speed is higher. On the road stretches at risk for the presence of wildlife, a speed of about 80 km/hour is already excessive and, when surpassed, the risk of accidents practically doubles. The animal appears to the driver so suddenly that he/she cannot react properly and the needed space for stopping the vehicle becomes too long. To prevent this, we must act on the one hand on the behaviour of drivers by installing, at points of recognized criticality, tailor-made warning signs, hold-up sound bars and electronic speed detectors and, on the other hand, by alerting wildlife through the positioning of optical reflective studs on bollards that may discourage crossing the roads only when vehicles are coming up. In selecting mitigation measures, as the type of traffic is characterized by low traffic flows and inserted in a matrix of high and widespread bio-permeability, we have decided to give priority to wildlife movement, not preventing the animals from crossing “the obstacle road” but providing for their safety through specific devices and projects in order to reduce the “barrier effect” (Catharinus et al., 2002). Indeed, the project area is affected by the passage of very mobile species with eco-ethological different habits, for which the preferential routes are not precisely determinable or are extremely diversified according to species-specificity criteria. Studs are needed to deter wildlife from crossing roads particularly at risk. They are prism-shaped and triangular-basis devices that are installed on guard rails or on bollards at a varying height according to the target species. The light from approaching vehicles, illuminating the reflective devices, is reflected into adjacent areas with reflection angles that are not visible and not disturbing for drivers and generate a sort of “optical barrier of protection” for the fauna in the road vicinities. Wildlife, in fact, is alerted by the sudden glow and stops or moves away from the light curtain. The colour of these devices can be red, white or blue. Such systems are particularly useful on roads with a low traffic intensity, typically driven everyday by a number of vehicles between some hundreds and 10,000 and characterized by a quite long interval between a vehicle and the next one that does not produce habituation to the light beam in the animals and allow them to cross. Along the slopes with inclinations greater than 5° the distance between a stud and the next one must be reduced and it is necessary to use the type of reflector suitable to these areas. In wooded areas, the effect is screened by the presence of trees, so you need to install studs closer to each another. In flat areas, the light beam must be oriented parallel to the ground, whereas it is necessary to orient the devices so as not to exceed an inclination of the light beam of 45° as regard to the ground when the road is sloping. The device installation height varies according to the target species (about 70 cm for bears and other medium sized and large mammals). Road signs are aimed at warning drivers and making them slow down. On the road stretch that we’re taking in account we want to install four panels with reflective film and LED blinkers, fed by a photovoltaic panel, one each 4 km (2 panels each roadside). On the yellow panel there will be the drawing of a bear with an Italian-English writing: “speeding kills bears”. Hold-up sound bars led drivers to slow down in the most frequented places by wildlife. In the road stretch at issue, sound bars should be installed in four points with four bars each, one each 4 km (two each side). For each point it would be installed a triangular danger signal (signalling sound bars). Clearing the road sides increases the visibility and deter wildlife from crossing the road, especially medium sized and large animals, visible also from a distance by a driver. This measure is fundamental in those points (bends, humps) where the road conformation reduces visibility. We believe that, along with mitigation measures, Police should apply all those preventive and repressive measures, according to the existing rules, to make sure speed limits (50 km/h) are strictly enforced at least on this sensitive road stretch ( Gioia dei Marsi – Gioia Vecchio ). It is also very important to inform and raise the awareness of some particular categories of people that use this road more often than others (commuters, ARPA bus drivers and bikers). The road stretch at issue is a regional road connecting small towns of great tourist traffic in the National Park of Abruzzo, Lazio and Molise. It is the main road that leads to Pescasseroli and the National Park of Abruzzo, Lazio and Molise. It is, from a typological point of view, a “halfway up” road with the roadway located between a side that rises and another that descends; the typical road that cuts a mountainside. Along the considered stretch, except for the road itself, there is no additional barrier. Wall: you can see some walls of different heights along the road sides. Meshwork: the sides may have different mesh at different heights. The road passes through woodlands featuring oak (Quercus pubescens, Quercus cerris), maple tree (Acer campestre, Acer monspessulanum), ash trees (Fraxinus ornus), hop hornbeam (Ostrya carpinifolia). On the roadsides there are bushes, such as juniper (Juniperus oxycedrus), and open areas with garrigue. Road mortality means the study of wildlife mortality caused by collision with vehicles. The majority of collisions occurs at night, with peaks at dusk and dawn and between May and September. That happens not only for wildlife larger movements during the summer time, but also for the increase of vehicular traffic in areas frequented by wildlife such as National Parks. There is a high risk of collision with the Marsican brown bear in the Abruzzo NP, as two events in 2011 and 2012 testify. But the first news on bear-vehicle collisions dates back to the second half of 60s. Since 1972 Zunino and Herrero have identified “a danger to the Marsican bear” in the many roads, recently paved, that channelled “large volumes of high speed traffic”. In 1967 three bears (a female with two foetuses in her utero) were killed by drivers in the Park. In 1976 again a study by Zunino on the ecology of the species identified, during the course of his research, a series of measures to be taken in order to protect the Marsican brown bear, including the problem of bear-vehicle collisions. Among the general measures to be achieved in the long-term, Zunino showed how it was important to fix the “speed limit at least 70/50 km/h on all roads in the area inhabited by bears, to be imposed by the competent authorities” and to avoid accidents in the most dangerous stretches by the installation “by the National Park of the appropriate warning signs and advice to slow down.” Zunino emphasized how “almost every year, in particular sections of road, fatal accidents occur to bears through their night movements (from 1964 to 1973, 11 bears were killed, 3 bears each year in 1967 and 1973)“. 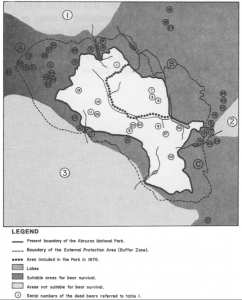 Boscagli (1986) reports that in the period 1970-1984 45 bears were found dead in the Abruzzo National Park and External Protection Area (ZPE A + B + C, see photo). Of these, 9 due to road accidents. In part 3 in the “A” of the ZPE and 6 in the “B” (27, 3% of total deaths in ZPE). Among these deaths, the railway accounts for 54.5% of total deaths in area “B”, so that the state railways began to study two possible solutions to remedy bear-train collisions: “build electrical or ultrasound barriers next to the crossings used by bears and planting vegetables and alternative food resources to attract the bear to strategic points“. Even on the Motorway A25 (Torano – Pescara) accidents involving the bear were reported, as in the 90s, when a bear was hit by a truck at night near Bugnara (Boscagli, personal communication). Coming to our days, as has been already told, on May 3, 2011, in locality Valle Chiara, an adult female was found dead on the road SR 83, few kilometres from Pescasseroli (AQ), hit while crossing the road with her three cubs that luckily survived. On October 12, 2012, a one-year-old cub was hit by a car near Scanno (AQ) but luckily it was not seriously hurt. Collisions in areas outside the National Park of Abruzzo, Lazio and Molise were ascertained at various times. The incident in the Simbruini Regional Park is emblematic. In the autumn of 1943, a bus left in the middle of the night from Filettino and heading for Rome ran over and killed an adult male bear feeding on the cultivated fields near the village (Serafini, personal communication). More recently, a collision occurred, with no apparent consequences, near the town of Castiglione di Tornimparte, in the province of L’Aquila, in October 2010 (Nisi, personal communication). Also in Trentino (Northern Italy) bears have been victims of several collisions. Only in the last two years there were three collisions always ending with the death of the plantigrade: April 22, 2012, a bear hit by a SUV on State Road Brennero on July 24, 2012; on the road near Bolbeno (TN) the impact with the bear threw a car off the road and the driver was injured; and on June 8, 2012, on the highway Merano – Bolzano a car burst into flames after a collision with a bear. Again in Trentino: in 2001, the female bear cub, “Vida” was hit by a car on the Brennero motorway between Trento and Bolzano; in 2005 in Val Rendena another bear was hit, but it did not suffer serious trauma; in 2008 a brown bear cub was found dead on the roadside between Preore and Villa Rendena, probably hit at night by a vehicle, and in 2009 a gamekeeper invested a bear, later survived, in the area of Passo Palade. 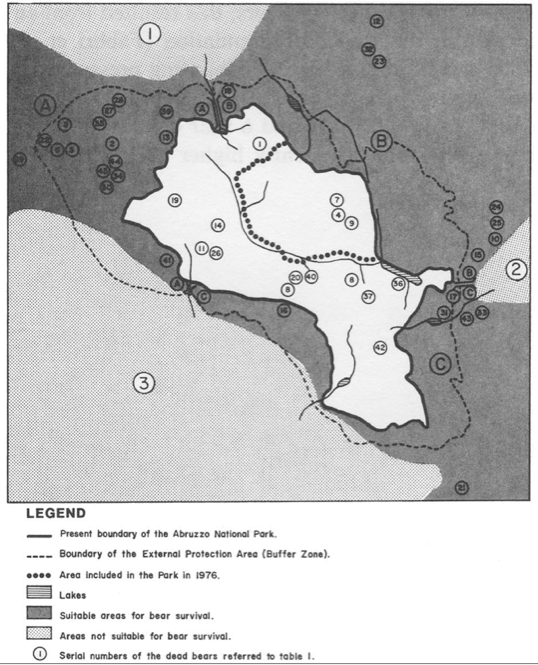 Even in one of the sanctuaries of the American wilderness, the Yosemite National Park in California, the National Park Service is studying how to prevent the causes of accidents, and in general the relations and interactions with man activities, through the “Yosemite’s Interdivisional Bear Team”. The team has compared the data of road accidents involving bears and noted in 2010 (compared to 2009), a decrease of 3% of accidents but an increase of 30% of damages. In 2010, dozens of bears died because of collision with vehicles. Only in 2012 (to date) there have been 144 accidents (26 of which in wilderness areas) 26% more than last year and 90% more than 1998 for a total of $ 38,025 in damages. Since 2007, the Yosemite National Park has started a programme of road safety education addressed to visitors entitled “Red Dead Bear-Bear” to minimize bear-vehicle collisions and to encourage visitors to observe the speed limits. The programme includes the installation, on the road where most collisions occur, of specific yellow boards illustrating a red bear. The design, writing and colouring are based on the 2003’s recommendations by the “Wyoming roadway and wildlife crossing study”. In addition, the programme provides for the posting of panels, leaflets and posters in visitor centres and shopping centres. The same recommendations and initiatives are taken by the Washington State Department of Transportation. Besides the Marsican brown bear, medium sized mammals such as wolves, and large mammals such as red deer, roe deer and wild boars, may benefit from the mitigation measures. Reflective studs: The angle of the reflected light beam with respect to the ground level should not exceed 45°. So, during installation, the studs must be placed at an angle which satisfies this condition. Indicatively, the distance between a stud and the next one must be of 25-50 metres on a straight stretch of road and up to 10 metres in the corners and along slopes with inclinations greater than 5°. Signs and electronic speed detectors: must be placed on the roadside in compliance with the requirements of Article. 23 of the New Code (Legislative Decree 285/1992) and in agreement with the authority responsible for the infrastructure. They should be placed at the ends of the road stretches most affected by the potential presence of wildlife and replicated within the selected segment if there are junctions and crossroads. Hold-up sound bars: must be applied in series (minimum 5/7 consecutive elements), parallel to one other, in a transverse position with respect to the running direction and perpendicular to the road axis. Generally the series are repeated for the length of the segment of interest in a variable number, properly spaced out and often consisting of an increasing number of facing forward elements. To contact bikers associations and ARPA (Abruzzo public transport Agency). Quotes for sign posts to be installed. Public presentation of the project and road stretch opening. Reflective studs: 2 annual inspections must be made in order to clean the studs by a water jet, verify the presence of any damaged stud and proceed with the appropriate replacement. It is also necessary to prevent the growth of thick vegetation around the bollards that might limit the light beam propagation. Hold-up sound bars: they must be renewed if worn, but generally not earlier than 3-5 years, depending on the volume of traffic and climatic conditions. Roadside maintenance: consisting of pruning or cutting shrubs along the roadside, or mowing the grass. Reflective studs: The system does not represent a barrier to crossing roads, so it does not increase the habitat fragmentation. It is low-cost and is easy to install and maintain. 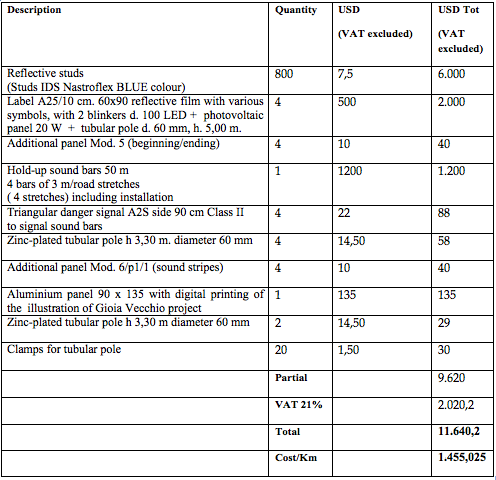 Road signs: it is easy to manufacture, install and maintain. It has economic benefits. Hold-up sound bars: require almost no maintenance, are quite effective to slow the vehicle. Road maintenance: clearing the roadsides is cheap and easy to implement as part of the normal road maintenance. Reflective studs: the monitoring conducted in Italy and abroad to assess the effectiveness of this method did not give unequivocal results: in some cases it was recorded a clear reduction of accidents, especially regarding ungulates, in others not. It is likely that this discrepancy depends on the installation techniques and local conditions. The system requires no maintenance. In some experiments it was noted that the use of studs of unusual colour, such as blue, draw the attention of drivers who, seeing the mitigation work, perceived the risk more and proceeded with greater caution. Road signs: they may be insufficient as the only solution taken. They are most effective just installed, because the drivers familiar to the road might get used to the signs and not pay attention anymore, as it currently happens with warning signs prescribed by the Highway code. Hold-up sound bars: their installation is relatively expensive compared to other mitigation measures because special materials and procedures are needed to apply them. Battisti C., 2004. Frammentazione ambientale, connettività, reti ecologiche. Un contributo teorico e metodologico con particolare riferimento alla fauna selvatica. Provincia di Roma, Assessorato Politiche agricole, ambientali e Protezione civile, pp 248. Boscagli G., 1987. Brown Bear mortality in Central Italy from 1970-1984, Proc. Int. Conf. Bear Res. And Manage. 7. (Plitivice, YU, 2-5 march 1986), Ursus, 7. Catharinus F. Jaarsma G. e Williams G.P.A., 2002. Reducing habitat fragmentation by minor rural roads through traffi calming. Landscape and Urban Planning. 28:125-135. Ciabò S., Fabrizio M., 2012. Linee guida per la prevenzione di incidenti stradali causati da fauna selvatica nella Provincia di Pescara. Provincia di Pescara, 136 pp. Morini P. e Di Nino O., 2010. Infrastrutture viarie e fauna selvatica nel Parco Regionale Sirente Velino. : 4-7. In: Fabrizio M., (eds) 2010. Atti della Prima Conferenza del Centro Studi per le Reti Ecologiche “Road Ecology: nuovi strumenti nella pianificazione infrastrutturale”. 4 ottobre 2008 – Pettorano Sul Gizio (AQ). I quaderni del Centro Studi per le Reti Ecologiche. Volume 3: 64 pp. Boscagli G, 1986. Brown Bear Mortality in Central Italy from 1970 to 1984. Int. Conf. Bear Res. and Manage. 297-98. Zunino F., Herrero S., 1972. The Status of the Brown Bear (Ursus arctos) in Abruzzo National Park, Italy, 1971. Biol. Conserv., 4, (4): 263-272. Zunino F., 1976. Orso bruno marsicano (Risultati di una ricerca sull’ecologia della specie). In S.O.S. Fauna. Animali in pericolo. Scritti sulla difesa delle specie animali minacciate nel decennale dell’Associazione Italiana per il W.W.F. A cura di Franco Pedrotti. Camerino, 1976.